Note: The month of March might be slow around here. I hoped to get ahead of some planned travel, but with four of the last six days derailed by kids’ snow days and their flu, it hasn’t happened. The good news is that I have plans and outlines for at least a dozen articles. Today, I want to share one such article with you. It’s called The Opportunity Wedge and it’s on the website Live Your Wage. I’m going to describe it, but feel free to click the link above (it will open the article in another tab), because you’ll probably want to read his take on it too. Essentially the concept is that you are born with a huge number of possibilities (or opportunities) in life. As time goes on, the possibilities disappear until you get to a single point at the end of your life. Yes, it’s kind of morbid. Think about it. I don’t remember what I wanted to be when I was 5, but I’m fairly sure astronaut, basketball star, doctor, and firefighter were all in there. At age 42, firefighter is about the only one I’d have a chance at… and I’m not sure I’d make the cut there either. Some of the possibilities were actually eliminated by my DNA… the basketball star is one example. The opportunities can go away for any number of reasons. Personally, I became very interested in programming computers. I liked breaking big problems into smaller ones and solving them. When I learned more of what doctors’ jobs entailed, I found that I wasn’t interested in that. When you choose to spend your time in one way, you are also choosing not to spend your time in another way. I keep coming back to the opportunity wedge because I’m now a father of 5 and 6 year old boys. The oldest wants to make Pokemon real, so maybe he’ll spend a lot of time learning about DNA, RNA, and CRISPR. Maybe he’ll be interested in something else later in life. Whatever it is, I see my job as trying to keep their opportunity wedges as wide open as possible. This philosophy has some financial ramifications. Swim lessons, piano lessons, karate all cost money after school. There are some more frugal options, but keeping the opportunity wedge open means not just choosing something because it is the cheapest option. I hope no one paid $10 for @hookedonphonics like I did. The app keeps on freezing on the latest Amazon Fire HD 10. After the fourth freeze and reboot, I had to tell my sad child that we have to do something else. And sometimes it works out wonderfully, like the awesome Osmo Genius Kit. Keeping the opportunity wedge as open as possible also means spending a lot of money on private school. That’s been a very paralyzing decision, as I don’t see ANY other personal finance bloggers doing the same. (I may have missed some.) There’s not a day that doesn’t go by where I think, “The compound interest on this money would be tremendous down the line.” I have to remind myself that we can’t predict the future. Investing the money on education or investing it in the stock market are just different ways to keep that opportunity wedge wide. It’s easier to focus on their opportunity wedge than my own. I’m still not sure what I want to be when I grow up. However, recently I got excited about the idea of writing a book. It has been something that I’ve been toying with for years. Just the other day I had a completely new idea that has renewed my interest in that tremendously. Ask The Readers: Investing for Kids? A little more than a year ago, I wrote an article about whether or not to invest our babies’ money. The advice was overwhelming. Since they aren’t going to use this money (mostly birthday cash from relatives/friends) for quite some time, it should be invested on their behalf. Look at all this money! Unfortunately, I lived down to my Lazy name. I didn’t invest the money. On the bright side, they probably haven’t lost any money as I would have split it between domestic and foreign stocks. The domestic portion would have done well and the foreign, not so well. It’s time to fix that. I’d like to set-up a brokerage account for them. Even a year later, at ages 1 and 2 they won’t be needing the money for years. I called up USAA with a very simple plan: open up a brokerage account in each of their names, transfer their money into, buy an ETF, and watch it grow over the years. Open two brokerage accounts in my name. In this case I’d manage them as if they were my own. Open a UGMA/UTMA account for each of them. In this case, there’s some special tax treatment that I’d have to understand. It doesn’t feel right to have the money in my name. It’s their money. From a financial perspective, this money should be taxed at their income levels… which would be significantly less than mine even in the future. 1. When it comes time to calculate financial aid, it’s going to show up as their money. 2. The children receive the money at age 18 or 21 (depending on the state). What I have a problem with is that a significant portion could be taxed at the parents’ marginal tax rate. Reading this this tax codes makes my head explode. As I understand it, this was prevent a loophole where parents were using this to shelter their money. I don’t think money that was gifted to them by friends and relatives should be subject to our tax rate, but it seems like it is. I don’t know if this is an answer to my own question, but I’m thinking that this whole issue may be a moot point. I intend to buy an ETF in the brokerage and hold it for a long, long time. I think that would qualify it as a long-term capital gain and not subject to marginal tax rates. It makes me think that I should just open the brokerage account in my name and manage it myself. Just to be sure a call to my tax advisor may be of help. In case you were wondering, I’m thinking of buying Vanguard Total World (VT) as my one stock for them. The reason is that this provides great growth potential and diversity (in a domestic and foreign sense) with minimal risk (due to the long-term outlook). Also, since they don’t have a lot of money to invest, I want to keep the brokerage commissions at a minimum (a $10 commission is 1% of a $1000 balance). That rules out buying a portfolio of stocks. Ask the Readers: Best Place to Invest Around $1000? So the question then becomes, where do I invest the $1000? Ideally, I’d keep the expense ratio as low as possible and still have a diversified fund. If it were more money, I’d open up a brokerage account and buy Vanguard’s Total Market Index. However, for less than $1000, the commission to buy would be around 1%. I suppose that isn’t the worst thing in the world. At least it would be a one-time fee. After that, it would be Vanguard’s typical low commissions. Alternatively, it appears as if I could open up an account at Vanguard itself and buy a mutual fund perhaps avoiding the commissions. I’m probably over-thinking the commission. While 1% seems like a lot, in reality it is $10, which is pretty tiny, right? Perhaps not. He may get $100 to $200 on a birthday or something, which means that money would have to go to a savings account unless I want to pay a 5-10% fee via commission to buy more shares. That mutual fund is looking better and better. Mutual funds just seem weird to me as I haven’t invested in them in probably more than 15 years (outside of a 401K). Another idea is to go with Lending Club. As I was writing about yesterday, it occurred that me that it could be a good fit. The only problem is that I’m not sure my wife would be on-board with such an unusual idea. Maybe I can convince her with the humorous concept that a two year old would be lending money to a bunch of adults with financial problems. Even if I could convince here, I’m not sure that Lending Club will let a two year old open an account. It does look like there’s a custodial account. I’ll be the first to admit that I don’t know much about Uniform Transfers to Minors Act (UTMA) and Uniform Gifts to Minors Act (UGMA) types of accounts. However, these don’t seem to be a fit, since the money is owned by the children, it isn’t a gift from me to them. I know I’m all over the map with this topic. That’s why it is perfect for an “Ask the Readers” article. Got any advice to point me in the right direction? I’m referring to another article in the August 2014 issue of Money Magazine. It’s a slightly differently worded version by the same author of What It Costs to Raise a Wimbledon Champion. The article is filled with a lot of eye-opening expenses. For example, the article says, “elite players can easily spend $30,000 a year…” and breaks it down: travel ($15K), group training ($7K), private lessons ($5K), court fees ($2K), and equipment ($1K). While it may sound like a ton of money, such costs of elite training is nothing new. Olympic athletes and violinist prodigies have similar costs. In fact, the comments on a previous article covered this. Can you tell me what’s wrong with this logic? I’m guessing many of you caught it, but I’ll spell it out anyway. The $30,000 a year costs that are being racked are by “elite players.” Can you guess the talent level of the 0.8% of undergrads earning athletic scholarships? If you said, “elite players” we are totally in sync right now. It would be very interesting to know what percentage of people are spending $30,000 and NOT getting scholarships. While it is very unlikely, perhaps each and every one DID get a scholarship. From the data that’s presented, we simply don’t know. It isn’t necessarily likely to be a loss and the odds aren’t as bad as presented. The presented odds of 99.2% who don’t get athletic scholarships include oafs like me. I’m not going to make a case that it is wise to spend $30,000 a year for tennis training. I’m not going to say that it is a terrible move either. I’m going to say that it isn’t wise to presume that there’s going to be a return on investment… especially when there is an an uncertainty of receiving a scholarship… and that it might be worth less than years of all that tennis training. Perhaps most importantly, the financial component is just one factor when it comes to nurturing your child’s talents. I think most would say that it is a minimal one. I was reading My Journey to Millions last week and the topic of children accounts came up. Currently the kids, ages 21 months and 6 months, have savings accounts for money that was gifted by family and friends. It isn’t a ton of money, but it adds up. Obviously, it made sense to get them a savings account, which we did. That’s where the money has sat since. The inflation monster nibbles away at it each day. I think the question is obvious, should I invest this money for them? The people giving the money didn’t give it with instructions. The kids themselves are too young to express their own wishes… or even understand the concept of money. That leaves the decision up to me, right? It’s a difficult thing investing money for other people. I obviously don’t want to lose their money. It still seems like the right thing to do. The kids have no immediate need for the money and won’t for a few years. This gives it some good time to grow. The question becomes how to invest the money. Evan covers this in depth and settled on a blend of 70% stocks and 30% bonds. I like this idea a lot. The only downside that I can think of is that it isn’t a lot of money, so I have to keep commissions and other investing related expenses low. A $10 commission might not seem like a lot, but if it’s on $1000, that is 1% off the top, before we factor in expense ratios. I think I’ll grant the kids downside protection just in case there is a crash that never recovers. This way there is no chance that they lose the gift. Given the time horizon, I’m hoping they’ll learn how awesome daddy was to take advantage of this thing called compound interest. So let me turn it around and ask the readers. 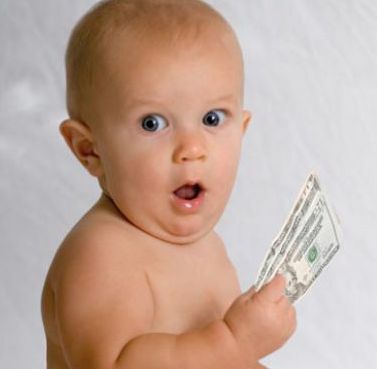 Do you invest baby money or just leave it in a savings account?